We waited for a sunny day to hike the trail down to Second Beach near LaPush, WA on the Olympic Peninsula. 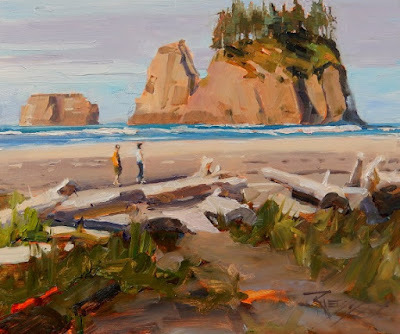 I painted here last year during PTP 2014 and even did a different view of this same sea stack. The beach was pretty crowded with hikers and campers. 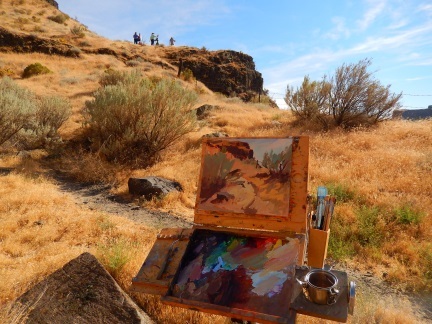 I picked a spot out of the way, in the shade, then quickly sketched my composition with a drawing brush and thin, Quin Sienna paint from Daniel Smith. I like the transparency and the more saturated, red/orange color of the pigment for under-painting in the Northwest where we have so much blue and green to deal with. The sun was moving very fast so I quickly washed in the shaded areas and then STUCK to my light/dark plan as everything started to change dramatically. 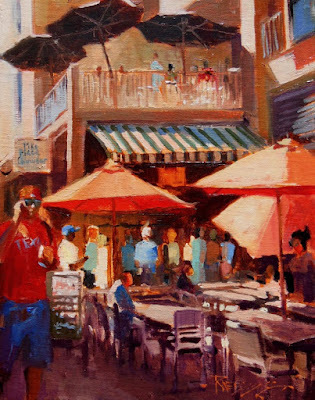 I finished this painting in about an hour and a half then packed my gear and headed down the beach to meet other artist friends. I was looking for something different from the last couple years of painting on Second Beach. The storm twisted firs marching up the bluffs caught my eye. 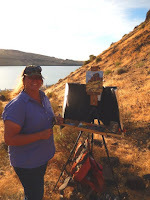 Artist Rhonda Thatcher McKay was in my field of view so I painted her in. 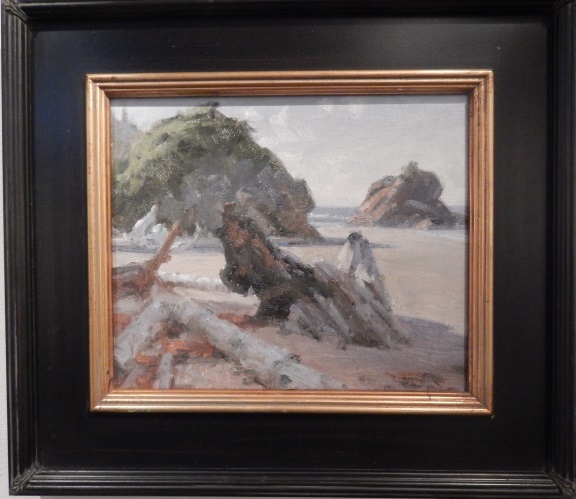 Many fine paintings were done down on the beach that day by artists including Jim Lamb, Bob Stem, Eric Jacobson and one of my favorites of the day by Ned Mueller. for info on this great restaurant and event destination located in Lynwood Center on Bainbridge Island. 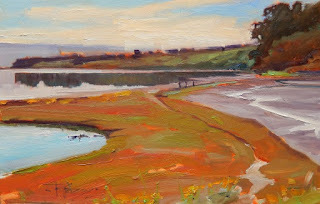 We were designated a painting spot on one of the days during Paint the Peninsula so me and painting friends, Jim Lamb and Melanie Thompson met early at the Dungeness Wildlife Refuge and headed for the beach. The Dungeness Spit is a long narrow strip of land five miles long with a light station at the end. 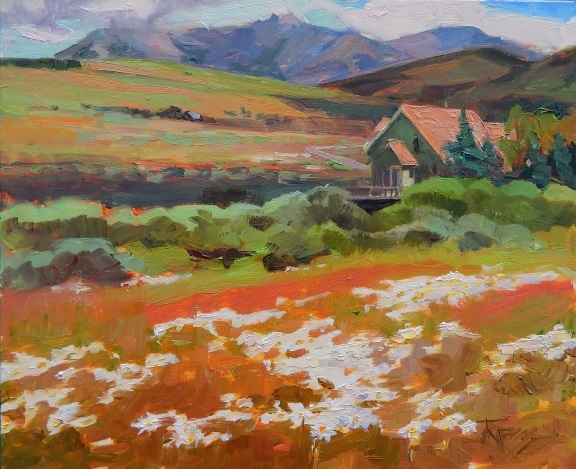 As one of the sponsors of PTP 2015 the Light Station Keepers would be judging and giving awards for the work done by the artists painting in the refuge during the day. The trail from the parking area is about three quarters of a mile. When we reached the end Melanie set up right there with a view of the Olympics peaking out through rapidly changing cloud conditions. It wasn't the best weather but it wasn't raining either! I hefted my pack down the spit where there was more driftwood. 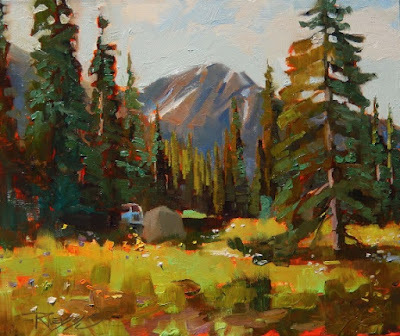 I found an interesting arrangement that would lead the eye of the viewer into the painting. I even moved a few pieces out of the way to make a better composition where one long piece of driftwood goes through the "eye" of another. The sun kept peeking out through the clouds. I snapped a picture so that I could reference my camera monitor to add shadows where I couldn't see them most of the time. 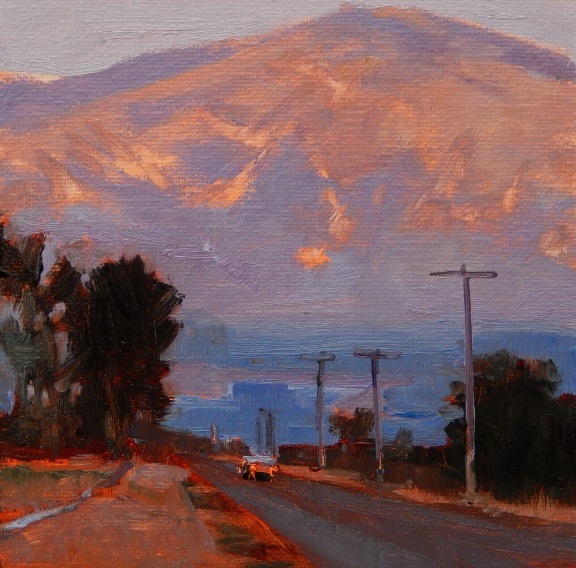 I punched up the color notes and increased the size of the Olympic Mountain range in the distance. 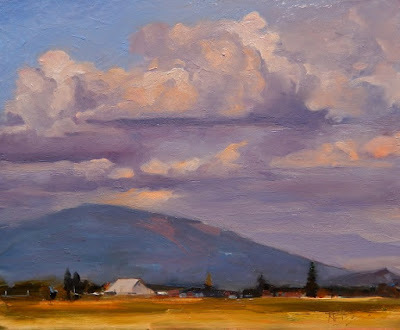 I was inspired by the color of the mountains and the way they were obscured by the clouds so I increased the saturation of the blue-green color of distant land seen through atmosphere. In the mean time the light station keepers came around to check on the painters and encourage us. 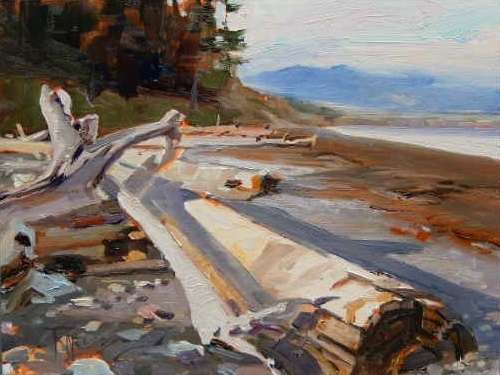 When I finished this one I moved to the other side of the spit where Jim was already painting. We were positioned at about 12 o'clock and 6 o'clock around a large tide pool formed as the tide retreated into Dungeness Bay. 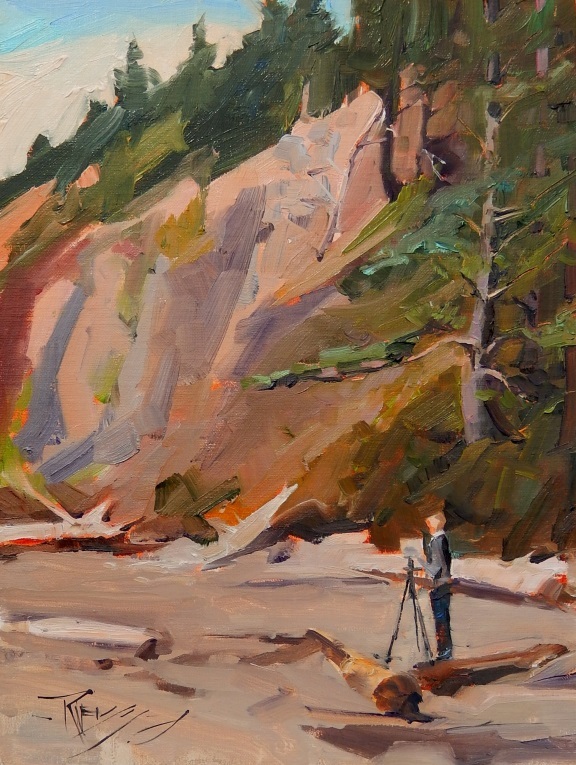 As we were painting I noticed something moving in the tide pool that looked like seaweed. There was no current since the pool was isolated by now and the movement caught my eye. I walked down closer thinking it may have been a sea otter but when close I recognized it as a Giant Pacific Octopus trapped in the tide pool. Jim came down and we both started taking videos of it. As it moved to a sandy area and settle down it would change color and blend in perfectly with the bottom. Then it would start moving and turn a rust red color. The funny part about this octopus story is when we got back that day I posted my video on facebook and it received over a thousand views. Jim posted his and since he took the video vertically it posted vertically and didn't get many views. Being new to facebook he was not sure how to rotate it and in trying to he re-posted it to his page six times and changed his profile picture to the octopus. Ha! You have to hear him tell the story! 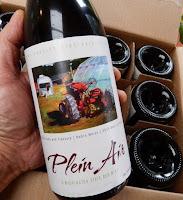 Looking back over my blog I realized there are no posts about Paint the Peninsula 2015! Yikes! That was a huge show for me this year and a great success as I won three different awards including Best of Show for this painting. There were so many adventures and so much fun meeting new friends that it will be hard to condense it all down. 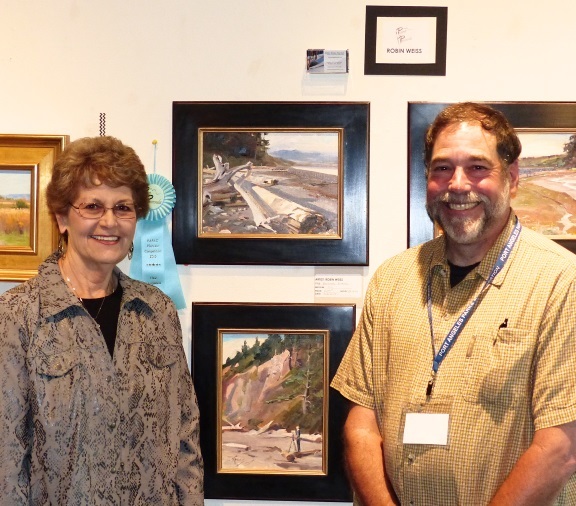 To start off I was juried into the show and given host housing with Jinx and Gunar in Sequim, WA. That turned out great because I had the opportunity to paint more in that area like Chi's Farm where Airstreams and Tractors was done. 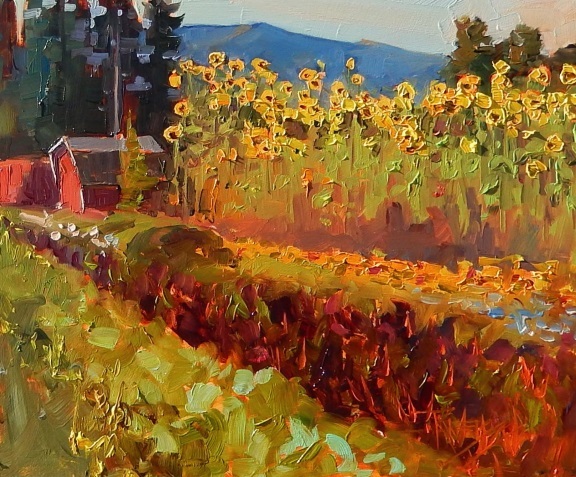 The long row of bright yellow sunflowers was the first thing that grabbed my attention driving down Towne Rd looking for a good painting location . 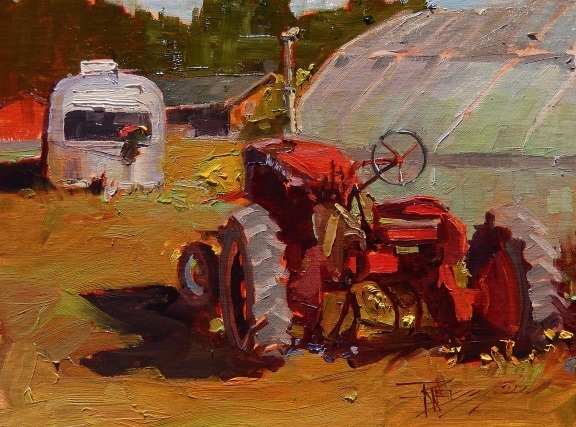 I pulled the van into the driveway and saw a small, neat little farm with a small shack and few Airstream trailers. The shack had a sign inviting friends to come in and pick up their eggs leaving money in a can on the desk. There was a card describing the farm as a CSA and a phone number of the manager. I called the number and explained that I was an artists and would love to paint on location there. Ankur enthusiastically said"Great! It's a good day, we are having our end-of-the-month pizza and veggie pick up party. I had noticed a thick column of smoke coming from the back yard but didn't know that it was a home made, clay pizza oven! Well that sounded good to me so I set up the easel and started my first painting. I wanted to capture the first thing that impressed me about the farm. The sunflowers! So I set up to do that painting first. I will post the finished painting in my next post. 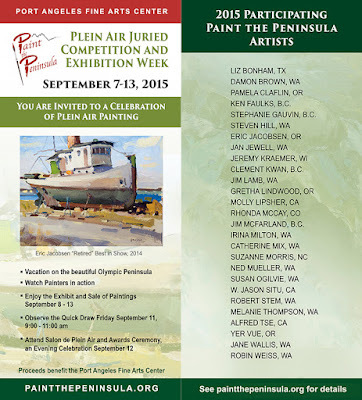 We had our annual end-of-the-season paint out, potluck for the Plein Air Washington Painters in Edmonds last month. It is always a great time to connect with friends and go over the years events and plan for next year....and there are great plans for next year! Lots of fun painting adventures to come! 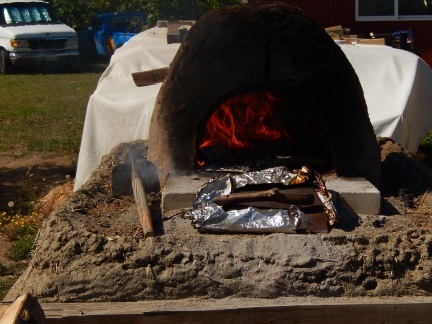 Check out PAWA's website HERE during the year to see what we are up to. Thanks for YOUR support and have a safe and blessed holiday season! Rumor has it that this whole block in Seattle will soon be demolished and the only business that will remain is this old and iconic bar called the Diller Room. Things are changing fast in Seattle and part of my job is to chronicle the old city as it was. You can see more of my recent cityscapes at Alki Arts located on First and Seneca, downtown Seattle. Awhile back I was invited to be in the Howard Mandville gallery Small Works Show. The show is over now but it was an amazing collection of fine art from some of the nations top artists. It was a real honor to be a part of it! They have kept over some of the paintings, mine among them and are still available to see and purchase in the gallery. If you are in Kirkland, WA. 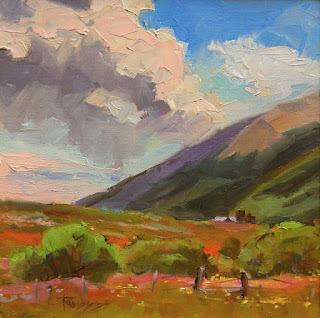 and have the opportunity please stop by and see this impressive venue of local and international fine art. 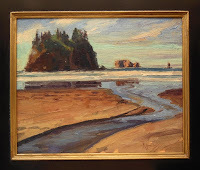 Labels: Howard Mandville Gallery, LaConner, landscape painting, oil, WA. Still pawing through old reference material. I have a pair of mat corners shape like an L that I can adjust with a couple paper clips to frame a composition within a larger photo. It's amazing when you do that how many interesting new compositions can appear from old photos. This is one from some older ref shots of a trip to Montana a couple years back when I took a workshop with my old friend Darrell Anderson, Kath Gill and Bob Phinney. 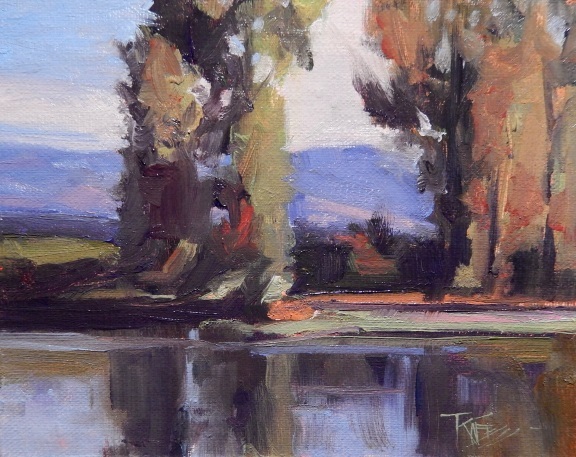 You can check out a post from that workshop HERE. The second in a series of miniature paintings I am posting on the Daily Paint Works auction site. 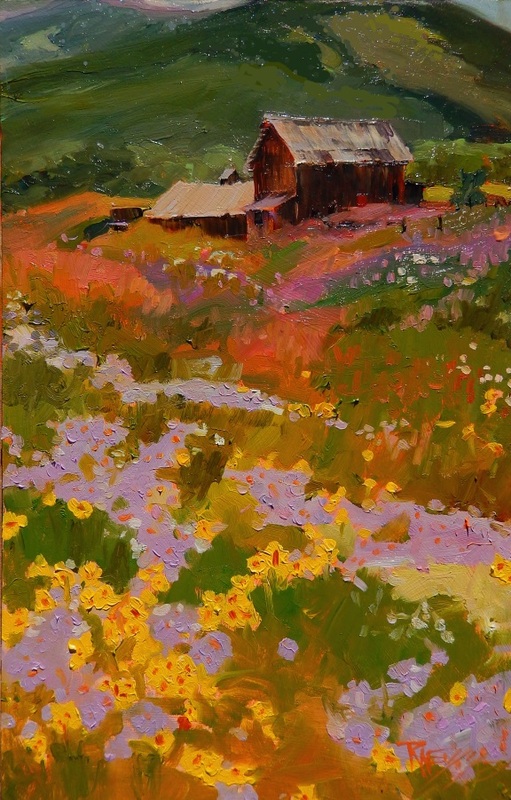 This was done from a reference photo taken on location in Montana several years ago. I'm so behind on my blog now that I'm not even going to try and catch up! lately I have been painting some landscape miniatures from my archive of reference photos as the rain falls and wind howls outside the studio windows. There has been a pretty good response to them on facebook with inquiries to buy so I will begin to post and offer them on the Daily Paint Works auction page. I'm having a lot of fun painting these and hope you like them as well! This is a scene I have painted a few times before from different angles. The Argosy used to be moored just as you turned up Alaska Way from the ferry dock.Of course everything is changed now that they are restructuring the waterfront in Seattle. 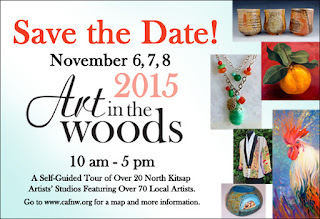 Arts in the Woods Studio Tour is coming up Nov 6,7,8! If you are in the area please stop by and say hi! I will have a lot of new work and older stuff at some good prices that are only available once a year at AITW! Hope to see you there! The First Ascent is a great little coffee shop at the end of Elk Street in Crested Butte. 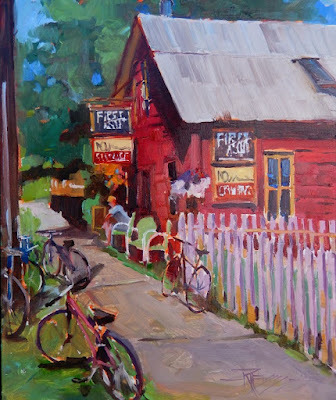 It's not far from Oh Be Joyful Gallery and I thought it would be a great subject for the "Quick Draw" competition during the CB Plein Air Open. 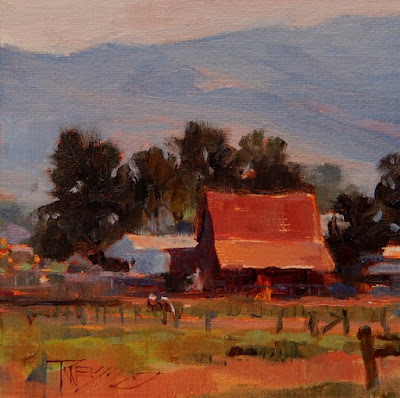 Quick draws are a common part of plein air competitions and generally you have about two hours to complete a painting from start to finish. 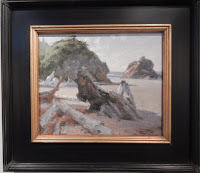 Then you have to hustle your WET painting back to the gallery get it framed and hung for exhibition in a matter of hours! It's always really stressful for me up until the painting starts to work...Once I realize the composition is coming together then I can relax and enjoy the ride. This painting took me all of the two hours to complete since it was pretty complex for a quick draw but it payed off and the painting sold in the gallery later. TIP; If you look closely you can see that I have mounted my panel in a floater style frame then wrapped the frame with brown paper. That way when I am done its easy to pull off the paper and the painting is already framed and ready to go! At Paint the Peninsula I got a late start on the quick draw. 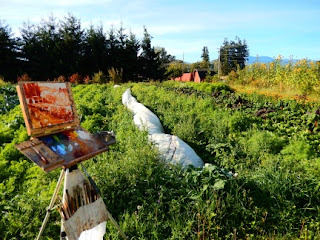 After finally getting situated the paint just flowed onto the canvas almost painting itself! I love it when that happens!! I'll be writing more about PTP in future posts! 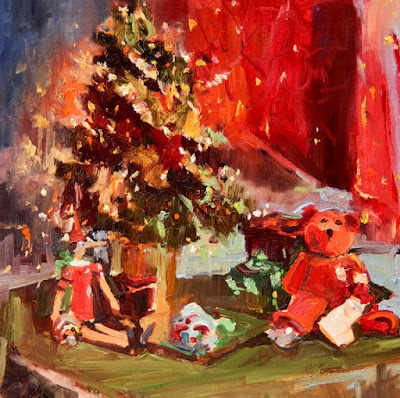 I'm still pretty far behind on my blog....So many paintings....so little time! 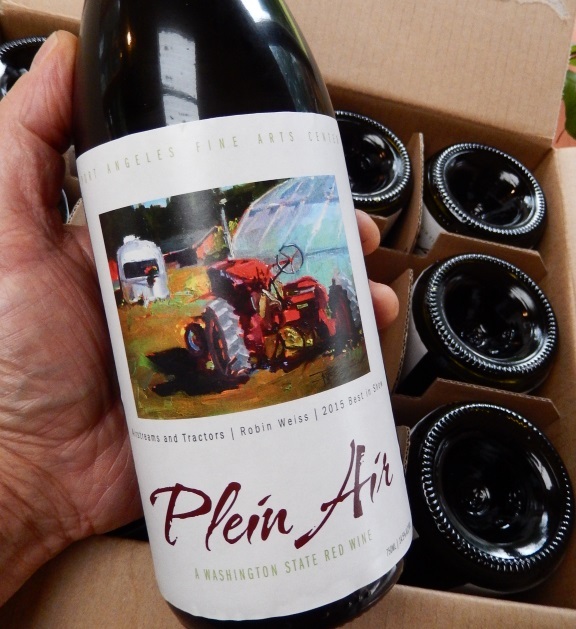 Stay tuned for more adventures....In Plein Air! 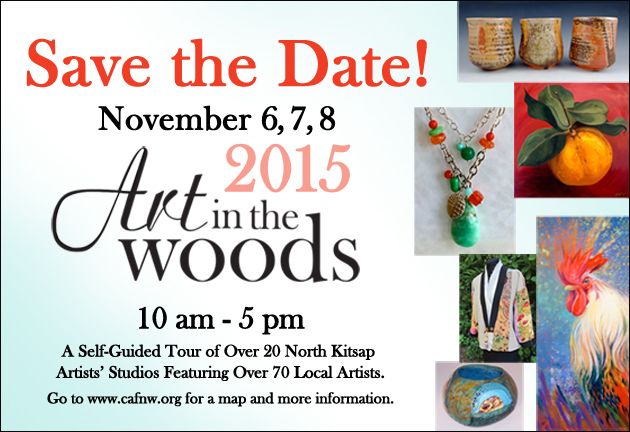 And don't forget if you are in the Kitsap area ...or even if you aren't..plan to attend our annual studio tour, Art in the Woods! 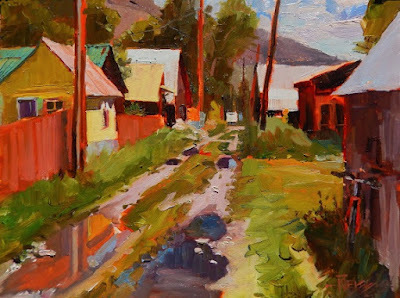 I was really attracted to all the quaint alleys in Crested Butte. One day after a rain shower I noticed the bright colors of the sheds reflecting in the puddles and had to paint the scene. This painting won Best of Show in the plein air open competition at Oh Be Joyful Gallery. 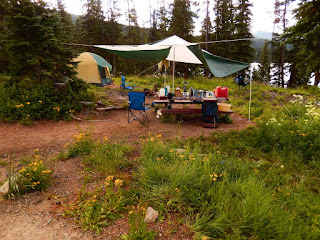 Time has gotten away from me yet again and I have neglected my blog...Boy has it been a busy summer!! Since posting last I have attended the Crested Butte Plein Air Open in Colorado, hosted by the Oh Be Joyful Gallery. 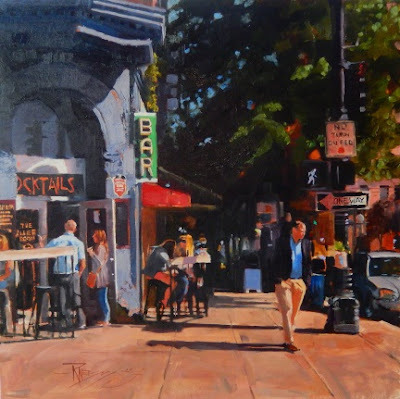 I completed 14 paintings in the three weeks I was there and hope to post most of them in the weeks ahead. 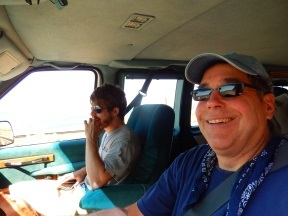 My son Maury came along for the ride down to Colorado. We stopped in Kenniwick, Wa. Twin Falls Idaho and Grand Junction CO. on our way, painting in each location. In Kenniwick we contacted Melanie Thompson, another PAWA painter and she took us to one of her favorite spots along the upper Columbia river. 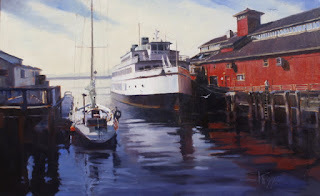 I did two paintings there. One was a scraper.The other one got lost along the way somewhere.Now that I am back I can't find it! Another shameless plug for my featured artist show at Alki Arts located on First and Seneca in downtown Seattle.The gallery is just a short walk from the ferry. If you go to the opening on August 6th you can also visit the S.A.M. 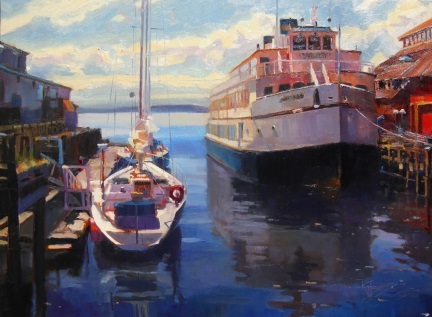 for free and check out the other galleries that are open late during Seattles First Thursday Artwalk!.....But don't miss my recent city scenes at Alki Arts! All the paintings are framed and ready to take over to Alki Arts. My featured artists show is coming up fast! Plan a fun evening out the First Thursday in Aug and come to Seattle, then stop by the Gallery on First and Seneca to view my recent city scenes! 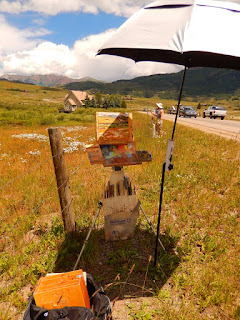 I'll be in Colorado painting some 12,000 foot mountains but my wife Ann will be on hand to greet you. Thanks honey! 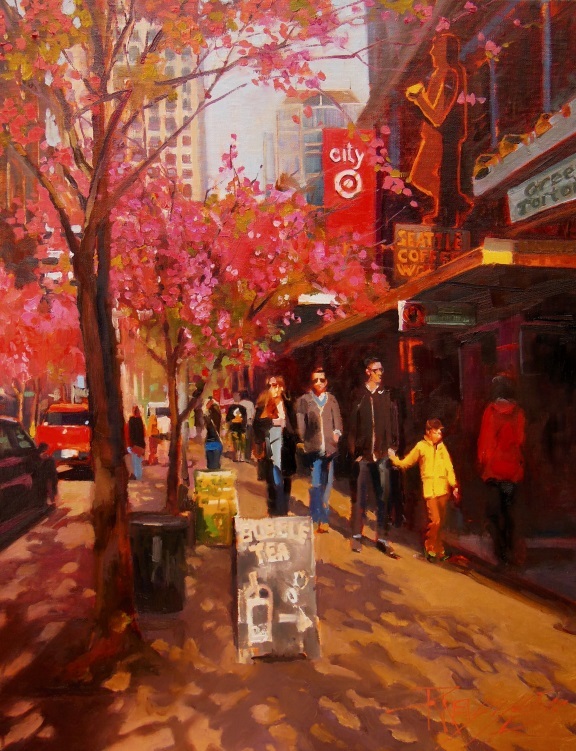 I painted this scene on location at Pike place Market a week ago. It was fun interacting with all the people walking by. Check out the video! 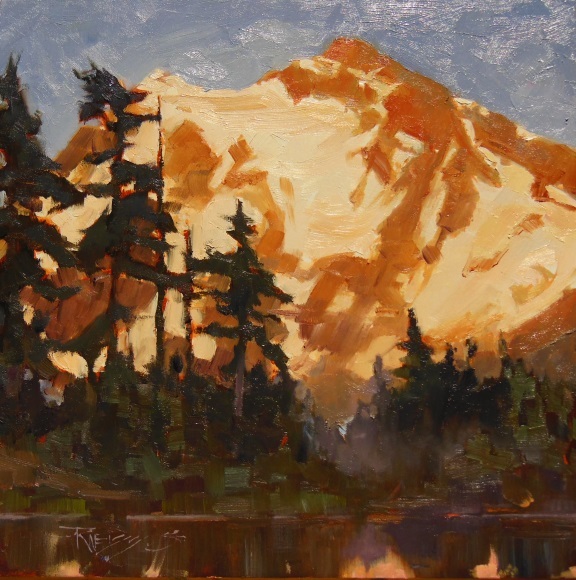 Can't get enough of this view of Mt Shuksan as the sun goes down and slowly turns the mountain to molten gold with Picture Lake reflecting the show. We didn't get back to Marks place till after 11pm but it was worth it!